Weather was not in our favor, it was scorching hot. For me, the highway was also not unknown. But then, do these things matter to a group of bikers driven by the urge to ride? The plan was to ride as much in the early morning and keep hydrating the bodies once it gets hot. About the accommodation, and itinerary, have I ever planned one? 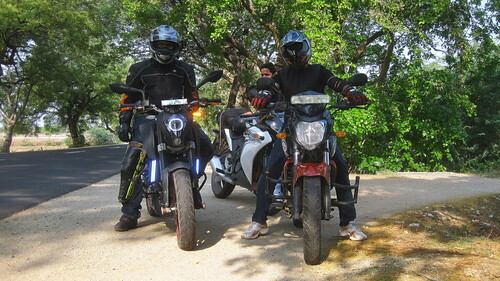 The uncertainty in my rides had made my friends join me for the ride and the freedom from my friends for me to exercise uncertainty on the ride had made me commit for the route I had done earlier once. It worked both ways, you see! Coming right down to it, we were to assemble at 4.45 am at my flat, and excluding the customary delays on everyone’s part, we began in good time after lubing the chains, tying the luggage, and discussing the route. We were 6 of us that day including my brother Prince who had come down to Hyderabad, committed to explore, try hands at adventure, and take the road not taken, if need be. In fact, we longed for roads which were not taken. An uneventful 200kms later, we found ourselves in Warangal and without waiting it out, headed for the Eturnagaram Wildlife Sanctuary. The Sun had worked its way up and we cooled ourselves down with 2-3 glasses of sugarcane juice. Every break post 11 am was about liquids, either to be ingested or released. I had found out about Eturnagaram Wildlife Sanctuary on the net but not much information could be derived, making it a quintessential stop for us. However, 50 kms before the Sanctuary, our bodies had given in to the sizzling oppressing heat. Plus our tummies needed to refill. 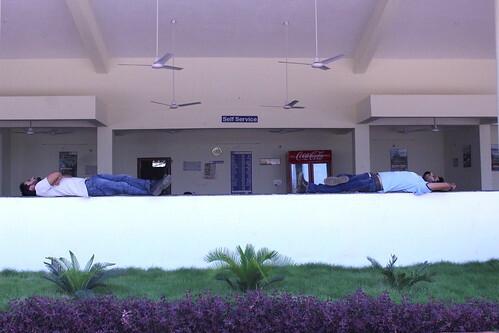 We parked at Haritha Hotel en route the Sanctuary, removed our jackets, helmets, and stuff, had food and just rested without even uttering a word to each other for a long long while. Once up, we lazied around a bit more and headed once again to face the torturing Sun which was slowly calming itself down now. 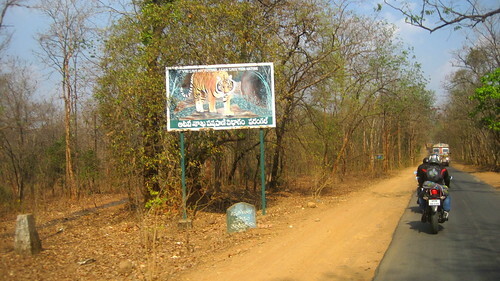 Around 110 kms from Warangal, Eturnagaram Wildlife Sanctuary is reached through almost 35 kms stretch in the jungle. The time we had chosen was peak summer, and none of the animals could be sighted. It is suggested to reach the Eturnagaram village and stay in the Forest guest house. 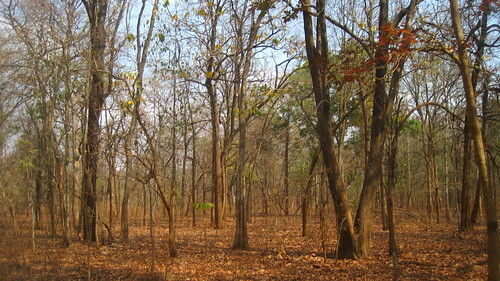 No wild cats are there anymore, but you can spot the deers, Nilgai, Sambar, Sloth bear, etc. One can also visit the Godavari bed nearby. It was clearly evident that the area was witnessing a solid Summer season: the tree leaves were not where they belonged – on the tree but were rather on the ground, dried, fried and crisp. None of the animals that are claimed to be found in the area could be found – hibernation time for all! It was really dry. 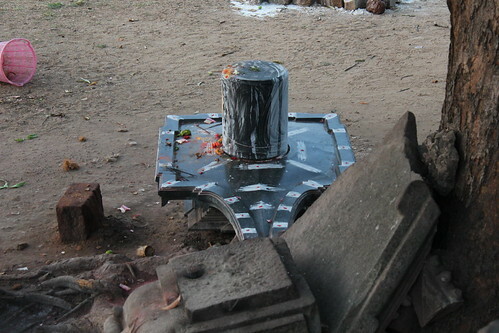 Disappointed a little, we headed back from the dry dusty hell that was Eturnagaram to locate a water body. ‘Ramappa lake is nearby’, the Haritha Hotel guy had told us. And lo, we went looking for the lake and a place to spend the night. I had visited the Ramappa temple on my previous ride too, but did not visit the lake for it is on the back side of the temple. We still needed a place to stay and it was getting dark by the minute. 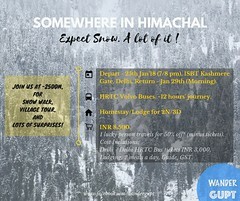 Haritha lake view resort was an option but hey, we don’t do resorts thing now, do we? While Prince and Ayush had gone near the lake bed to find out a place to camp, I was also on the lookout myself. And a lookout I found! Near the temple, facing the lake, there only 2 or 3 properties, most under construction at that time where workers spend the night. There was a makeshift ladder to climb on to the roof as hardly any work was done. Climbing that ladder, I saw the lake view on one side, and the green fields on the other. And, It was high enough to catch some wind which was not the case near the lake bed as Prince and Ayush reported. ‘Are we camping on the roof?’ Chatty asked. ‘No, of course not. It’s too hot to camp. We can sleep right under the stars on our blankets and keep our luggage in one tent.’, I replied. And awesome as all folks were, they agreed except for my brother who too eventually gave in. 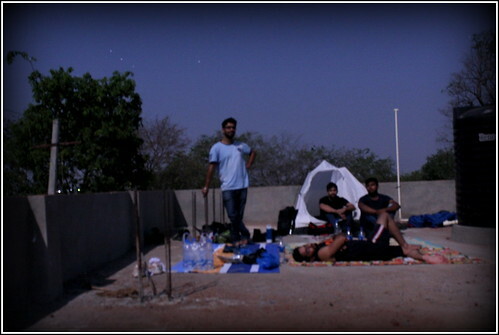 Ayush, Chaitanya and Harsha went to get food for all, which we had sitting on the roof of an under constructed Govt. property while some lights from very far away glimmered in the lake water. The insects kept us company throughout the night. And the mosquito repellant came to a grand use. It would have been one awesome night had it not been for the complaining of the workers who slept there usually and relentless snoring of some. Naah, it was still awesome, and the roof was big enough to provide sleeping space for all with some adjustments. Come next day, we were up early knowing what the Sun does when it does its thing. 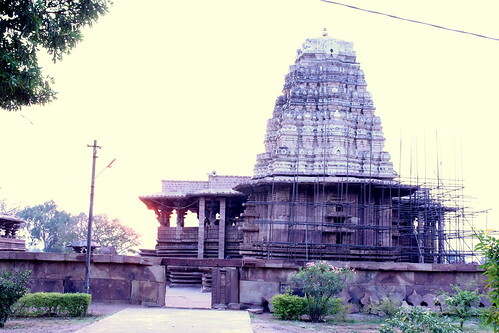 We paid a quick visit to the Ramappa temple, and headed directly to Hyderabad. Who wanted another beating from the Sun, eh? We still couldn’t avoid it fully. And hence, we were roasted by the time we reached home which explains the title of this blog. 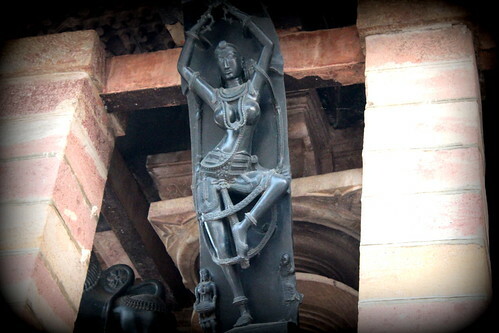 –Why Hampi needs a visit and a revisit? Guess the trip would have been better during the winter.,,though you would not have got to see the monkey with the ice cream. The deserted road looks good. Man! Don’t tell me about the heat. We recently did a quick run to Lepakshi and was it how!! Guess what, in this heat we also did a trek (if you can call it one) to Doodhsagar. Thankfully the weather was better on this one tho’ ! How was Dudhsagar? Which month was it? Loved the apt title for the post.Great shots. 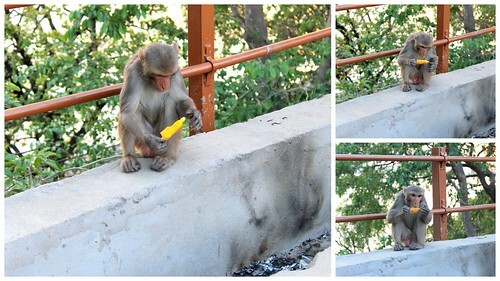 Lovely shots of the monkeys with the ice cream. Thank you so much Sri! Awesome man. Sleeping on the roof with construction workers of government property! Pretty awesome. However, for me some of the pictures are not loading and showing just a Flickr URL. It could be just me, but I thought I would drop a line. Thank you Mridula. The link was working earlier, and then I did a little editing, where something might have goofed up. Anyway, corrected now, thank you so much. Sometimes, unplanned trips are thrilling. I did a couple in the past and have no regrets about them. Glad to see you enjoy them too! 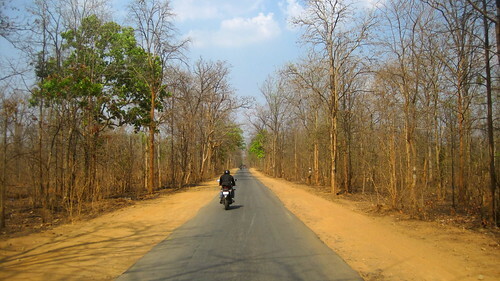 The road, the red soil and the trees in the first three pics reminds me of Shantiniketan in Birbhum district, WB. And I can imagine the heat! 🙂 You guys have accomplished an awesome task. Another great biking trip travelogue with some lovely pics 🙂 I like how your travelogues are vivid enough to take me along with them. That unusual ‘sleepover’ will stay with you for a long time, I’m sure. 🙂 And the pics with the monkey say such a lot about the scorching hot! Did you guys visit the Ramappa Lake at all, finally? Your roasting session was certainly worthwhile! Jatin, that sounds fantabulous, esp, your camping part!!! Thank you, it was a wonderful experience. I’m glad you liked it. Roadtrips are always fun, try some. What an amazing trip! Even it sounded and looked very very hot!!!! Wow what an amazing Pics!. I really like this post and you people are very cool. Nice trip.